Stores reference 22C/2117. Size 2 Regular. By Helmets Ltd. of Wheathampstead. 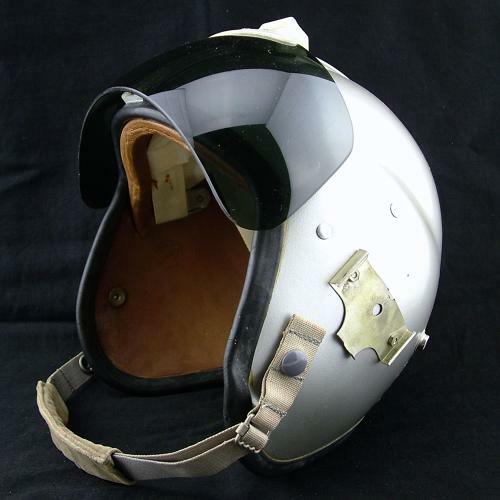 Classic early bonedome worn in conjuction with the type F or G inner helmet that contained the avionics and to which an oxygen mask could be fitted. The MK.1A is a basic protective helmet in leather lined fibreglass. It has a simple nylon webbing suspension system fitted inside to give a comfortable fit over the inner cloth helmet (not supplied). An anti-glare visor is fitted, comprising a centre rail attachment and mechanism with a replaceable tinted acrylic anti-glare screen. The helmet is in the original silver paint finish and this is in very good overall condition bar minor scratches and chips. The rubber edge roll is complete but does have some cracking. Complete with very good visor track mechanism and tinted visor. The latter with with a scratch at the centre that could perhaps be improved with polishing. Very clean lining and a good chinstrap. This helmet is fitted with an unsual metal plate on the left side. This is bolted through the shell and appears to have been done as an official modification, possibly as a mount for a boom microphone. Very good '+' overall condition. Stock code H23079.